When Supreme Court Justice Sonia Sotomayor speaks, people listen – and many did exactly that at Stanford University on Friday. Sotomayor wrapped up her Bay Area tour by telling students that people can work together even in divided times. Her message was met with enthusiasm as she spoke about overcoming challenges, both personal and those the United States is facing. Then-President Barack Obama in 2009 nominated Sotomayor for the highest court in the nation. “We can't denigrate the other culture, we can't denigrate our culture. 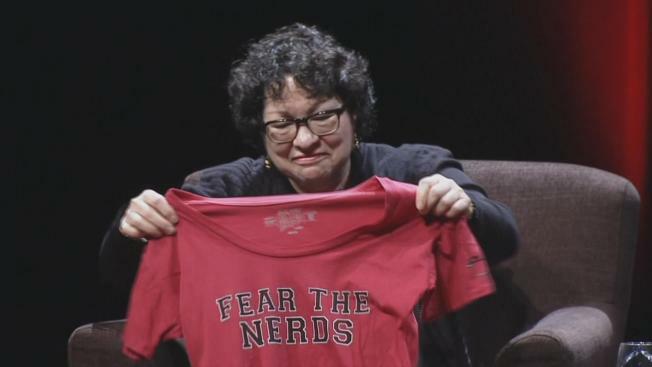 I take great pride in the Latina I am,” said Sotomayor, who walked among audience members, answered questions and even accepted a "Fear the Nerds" T-shirt. Stanford student Emily Walck left the auditorium energized. "I think she's amazing and her perspective, being a woman of color and overcoming the difficult things she's had to overcome to get to the places she's been, is really inspiring,” Walck said. Aliyah Chavez echoed the same sentiment. "It was one of the most incredible talks I’ve seen, and I've seen President Obama, I've seen Oprah, and she was hands down the best one,” she gushed. Sotomoyar, who on Thursday spoke to law students at the University of California, Berkeley offered some advice to the next generation — likely to face political conflicts — on how to reach compromises. "What they're afraid of, what they think they need to give them comfort, to get them closer to your point of view, if you can address those things, you can persuade those people," she said.